The Fletcher FD-25. Among the many rare and restored aircraft at Oshkosh in 2010 was one that has strong links with New Zealand aviation history—the Fletcher FD-25. 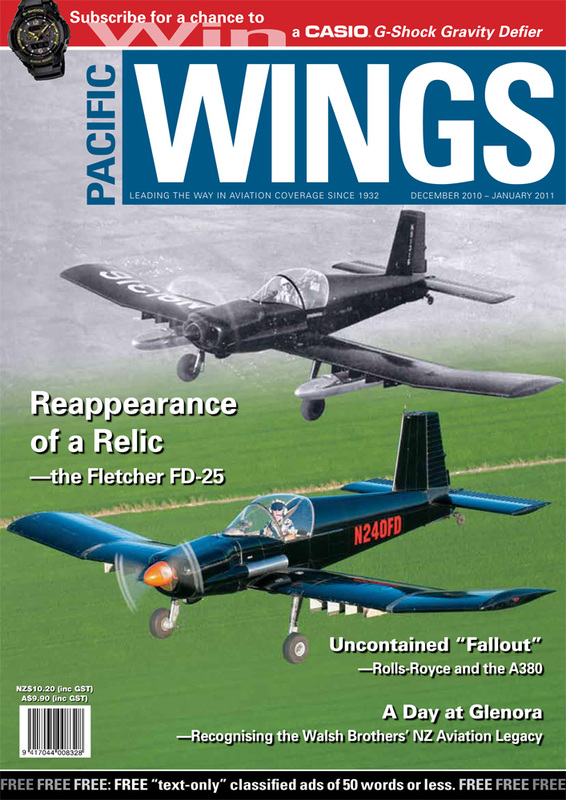 Mike Friend, who was fascinated by the Fletcher during his youth, reports on the aircraft’s restoration and its return to flight. On 28 May 1945, Curtiss Helldiver 19866 ditched in Lake Michigan after its engine failed. Sixty-five years later, the dive-bomber was raised from the depths by an experienced recovery team. Mark Sheppard gives a brief history of Helldiver 19866 and describes the recovery operation. Recognising the Walsh Brothers’ NZ Aviation Legacy.Ross Ewing summarises the outstanding history of two of New Zealand’s greatest aviation pioneers—Leo and Vivian Walsh—whose efforts and achievements, he says, deserve far greater recognition. Rolls-Royce and the A380. Rob Neil reviews the “fallout” from the uncontained engine failure that afflicted one of Qantas’s A380s soon after its departure from Singapore last month.